Surgery Connect adds contact centre functionality to EMIS Web, promoting simple-to-use multi-function patient interaction. 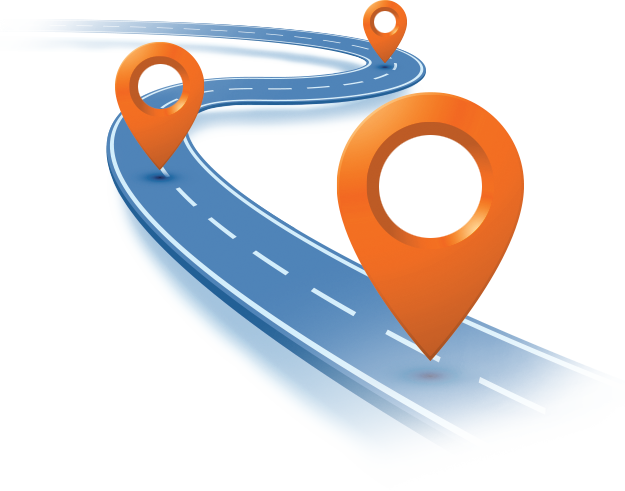 Omnichannel access to patients is immediately available to practitioners while interacting with patient records. EMIS Web integration is supported at single stand-alone surgeries, or in a GP Hub, or in a Contact Centre configuration where agents can handle calls and book appointments for a group of surgeries. Contact centre features, including intelligent call queueing and routing, highly secure call recording automatically attached to patient records, confirm and remind systems to reduce DNAs, telephone triage, extensive reporting, and clinical system integration, provide solutions to the GP Forward View high impact actions. Reducing the burden on NHS Administrative Staff allowing them to focus on patient interaction. Use calling number and speech recognition to identify patients phoning in, and automatically locate patient records. 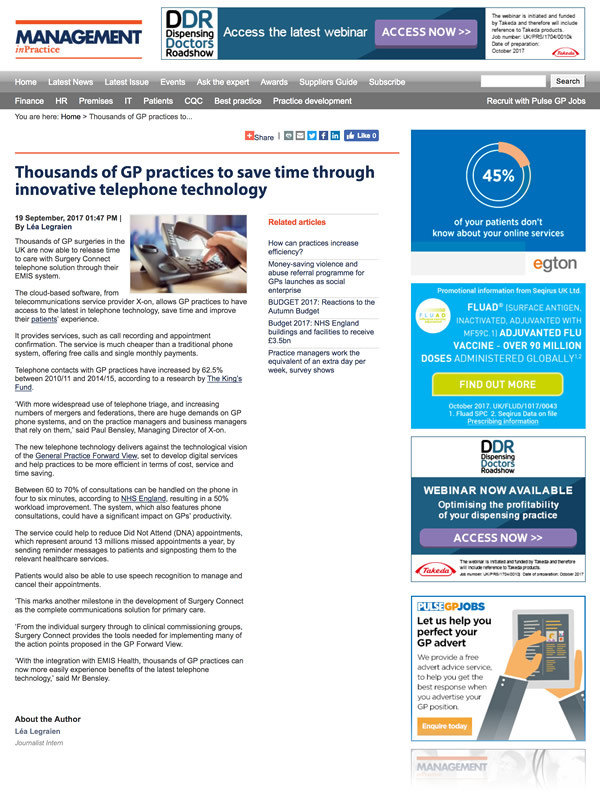 Single click dialling of patients from clinical records to save time and avoid errors. Quick access to previous call history and recordings via the patient record. Send a quick ad hoc, or template SMS, to patients from their record. 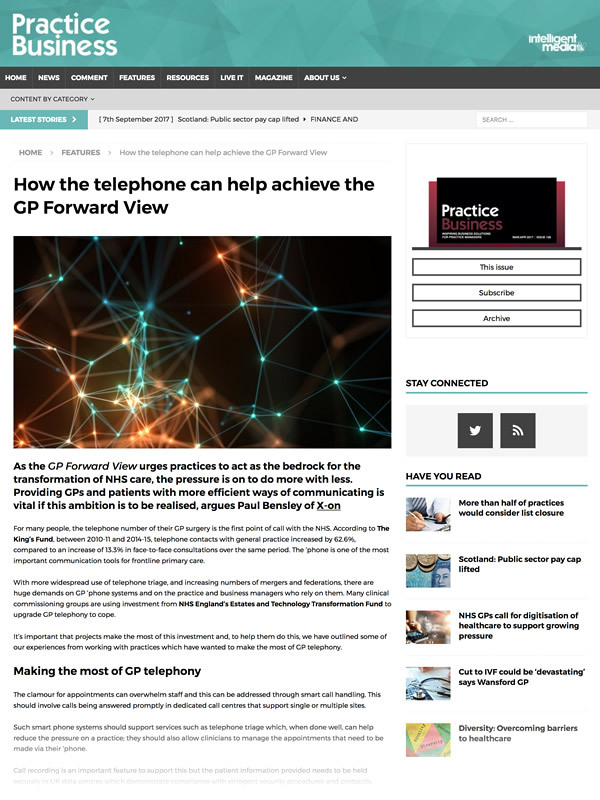 Allowing patients to manage their own appointments and receive clinical advice though telephony. Patients can manage their appointments using natural language advanced speech recognition with the clinical system updated accordingly. Patients can book triage call backs from health care professionals, or be connected for immediate advice. Patients with particular needs can be identfied and given options, or have calls directed appropriately. Patients can book repeat prescriptions. Giving Health Care Professionals access to full consultation history via patient records. Access to inbound and outbound (triage) call recordings via patient records. Access to video consultation recordings via patient records. 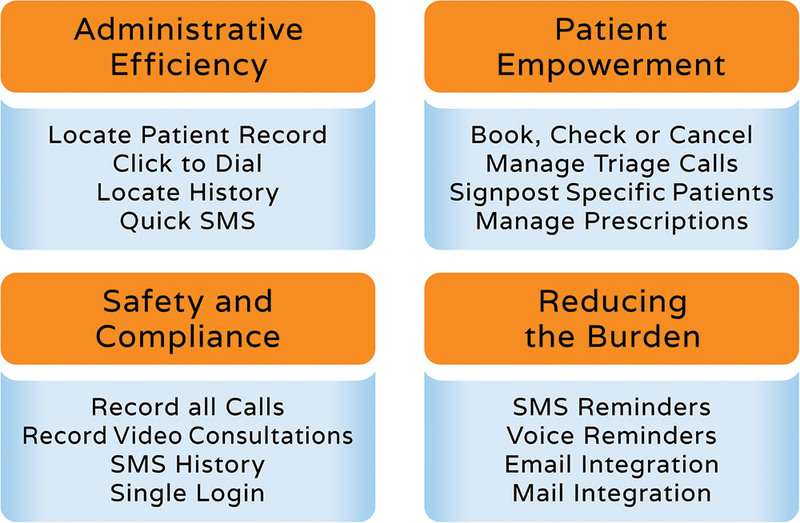 Access to the history of SMS to and from the patient via their records. For telephony and clinical system access, including card access for ultimate security. Proactive healthcare via notifications to at risk groups through appropriate channels. Appointment and bulk notifications via SMS with response path which updates the clinical system. Automated voice calls as reminders, or proactive clinic invitations, with an option to transfer to the receptionist. Integration with email and mail services (e.g. Docman) to provide a unified notification environment.